Focused on the ongoing opioid epidemic The Way We Live Now (2017) is a performance-based civic engagement project that uses a Susan Sontag short story to facilitate public conversations about opioids, chronic pain, and trauma. While the short story "The Way We Live Now" (Sontag 1987) is explicitly about AIDS and situated in an early moment of the epidemic, the story has also become timeless and impersonal in a way that makes it, actually, deeply universal. We may not all be (or think of ourselves as) directly affected by AIDS, but we have all experienced (or will) being sick ourselves or the sickness of someone close to us. Furthermore, the adaptation of this story during our current moment, situated as we are in the midst of the opioid epidemic, makes a connection between the AIDS epidemic and the opioid epidemic explicit: the number of people currently dying of opioid overdoses is roughly equivalent to the number of those who died in the late 1980s and early 1990s of AIDS. 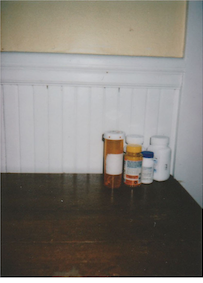 Through our personal experiences within the opioid epidemic, as a chronically ill person being treated with these medications and as someone who lived through the overdose of a loved one, we have come to believe it is a social and political imperative to make the relationship between the AIDS epidemic and the opioid epidemic clear. Not only in order to use the activism and community organising models developed by groups like ACT UP as a way of responding to this crisis, but because the AIDS epidemic provides a valuable lesson in demonstrating the horror and violence that accompanies the biologically-driven, fear-driven, stigmatization of people with diseases. We see this kind of stigma attaching itself now to those who are both affected by opioid abuse and those living with chronic pain, and believe that this lesson is one that bears repeating, writing about, acting on, and performing. The Way We Live Now (2017) therefore aims to invite and facilitate the public processing of what often remain private and painful experiences, in a participatory, audience-generated and multimedia format. Through a series of workshops set up for the general public as well as run for specifically invited community groups and stakeholders, we will use the model of Susan Sontag’s short story to ask: what does it mean to live within an epidemic? How do we continue living? Using the structure of the story as a foundation, we will develop a workshop program in which one larger group of participants, split into several smaller groups, have multiple ongoing conversations that are self-reflective and reflexive even as they are unfolding. Informed by the language and details Sontag uses, we will work towards a similar mix of specific and personal yet general and relatable situations, prompts and statements: centered on a unnamed ill person, as the story is, we will also create a fictionalized and creative format through which participants can be better able and more comfortable to share personal stories. Through these workshops, we will provide space for a particular form of coming out: whether pain, illness, drug abuse or use, discussions of these experiences often remain private, traumatic and sources of embarrassment instead of points of interpersonal connection and public togetherness. Gathering multiple forms of documentation (including first-hand reflections from participants, photographs, transcripts and audio recordings) throughout this process will allow us to develop a workbook and produce a publication that could be used by other groups to host their own workshops and as a guide for our own future programming. This future programming is vital to our goals, if only because the opioid epidemic shows no signs of ending or even slowing down. But the epidemic does not end in death. It is the way we live now, and we go on living. Our culture continues to struggle to find ways to process pain and trauma amongst the living while attempting to take political action to end the epidemic. Inspired by Sontag, who herself was a theater maker and activist, we recognize that any such attempt must be rooted in a willingness to openly engage with our lives, those of others affected, and with personal truths that feel risky, honest and necessary. Doing so will rely on skills Maia Dolphin-Krute and Jesse Erin Posner have developed through their careers as a writer and disability activist, and theater director and community organizer, respectively. Dolphin-Krute is the author of two books within the fields of disability studies and critical theory: Ghostbodies: Towards a new theory of invalidism (Intellect, 2017; Peer Reviewed) and Visceral: Essays on Illness Not as Metaphor (punctum books, 2017; Open Access). Through these projects as well as her positions as Editor at the disability-related literary magazine The Deaf Poets Society and the Boston-focused arts publication Big Red & Shiny, Dolphin-Krute has consistently worked to argue for and make available disability rights that attend to the theoretical as much as the physical; she strongly believes that the currently circulating discriminatory rhetorics of the opioid epidemic make the need for theoretical and imaginative rights all the more urgent. Working from a similar belief in the power and urgency of the imaginative and social, Jesse Erin Posner’s career and creative practice has revolved around the art of coming out: whether working as a theater director, community organizer or artist, she has focused on developing participatory public experiences and has done so with Saul Alinsky’s Industrial Areas Foundation (IAF), the Obama Campaign in 2008, the 9to5 National Association of Working Women, ArtsEmerson and The Theater Offensive. Producing a wide range of projects, Posner has focused on developing programs that remain inclusive, reflective, and respectful of those involved. Such a sense of inclusion and action is so important because we recognize that this epidemic is all of us, and that we must therefore take collective responsibility: for our relationship with these substances, for the social and political histories that have shaped this epidemic, and for the future responses of our communities.